Vertical alignment of table entry content. vAlignObj = VAlign() creates a vertical alignment object having the value 'top'. vAlignObj = VAlign(value) creates a vertical alignment object having the specified value. 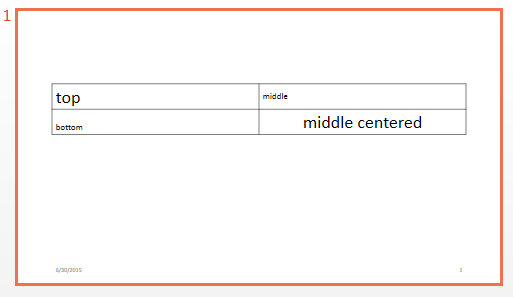 Vertical alignment of table entry content, returned as an mlreportgen.ppt.VAlign object. Vertical alignment of table entry content, specified as a character vector. Create a table using a cell array. Set the vertical alignment for each entry.